For a basic description of the Undo sub-tab, see: Using the Undo sub-tab in Clean.The "Create Playlists" Preference setting within TuneUp comes in quite handy if you ever want or need to Undo previously saved changes to your collection. 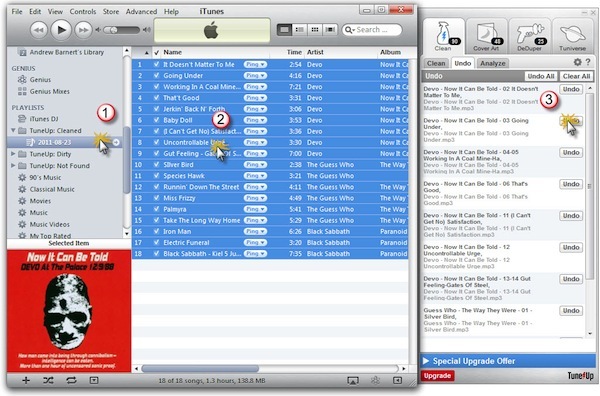 While "Create Playlists" is turned on, then you can use the Clean playlist folder in iTunes (or Windows Media Player) to playlists to assist you in finding songs and albums that have previously been "cleaned". 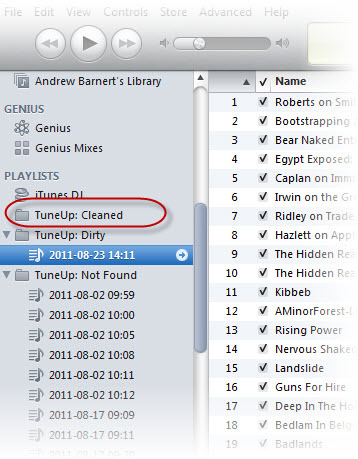 Drag the tracks to the Undo sub-tab within the Clean tab in TuneUp and Undo, the tracks will load and present an Undo button. Click this button to undo any previously saved changes to the song.